Do you find that because of your background as a Chinese-American, you have integrated your own characteristics into some of the characters? Especially because of your ancestry, do you feel a connection with the characters you have created? Have you ever been criticized for not having an authentic-enough experience to write your stories, considering you are Chinese-American? If yes, what is your response to critics? What made you write about the Boxer Rebellion? What is more special about this event than others in Chinese history that made you spend precious time on this subject? What kind of research did you have to do to make the story more authentic since you were originally born in California? Was your upbringing more American or Chinese and how did this contribute? How does your faith play a role when writing your stories? Can't wait to hear Gene's answers. 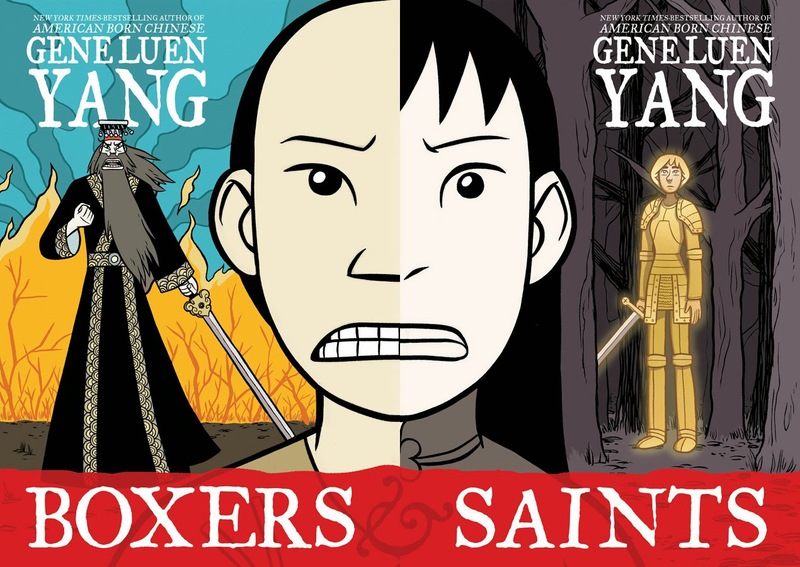 If you haven't read BOXERS AND SAINTS, I couldn't put it down. Historical fiction in graphic novel format is going to be my preference from this day forward. Here's some of what I wrote Gene after I finished it: "I love how Vidiana was able to protect her enemy with the Lord’s prayer. In the middle of such chaos and despair, you showed—with finesse and restraint—how one girl’s faith can make a difference. Thank you."